Have a late-night case of the munchies? 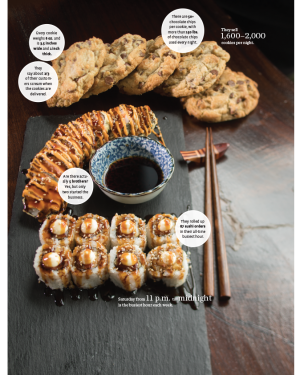 Look no further than Five Sushi Brothers and Chip Cookies, two Provo start-ups with hours to satisfy the most dedicated night owls—even those hungry at 2 a.m.
Siblings Christopher L. Wirthlin (’20), Stephen B. Wirthlin (BS ’17), and Sarah Wirthlin Wilson (BS ’06) had been throwing business ideas around for years, but when Sarah’s husband, Sean Wilson (BS ’04), wrote a solid business plan for Chip Cookies, “idle chatter” became reality. They rented one-hour time slots at a community kitchen, where they baked thousands of fresh chocolate chip cookies and then delivered them along with quarts of milk for dunking. After selling more than 10 tons of cookies—“roughly the weight of seven hippos,” jokes Stephen—in their first eight months, they now operate out of a bicycle shop they’ve converted into a bakery. After growing tired of the usual midnight burger and fries, brothers Jacob Y. J. Chung (’18) and Ammon Y. K. Chung (’15) started an after-hours sushi delivery service based out of a Mexican restaurant’s kitchen. Now in an abandoned-carwash-turned-sushi bar, the Chungs serve up delicacies like the popular Tiger Mom, a spicy tempura roll made with layers of Canadian salmon, topped with spicy tuna, shredded carrot, red pepper flakes, and sweet Thai chili sauce. A self-taught baker defied the odds—twice—to win Food Network’s Cake Wars.